In a wide-ranging Christmas interview on CNN with his chief propagandist David Axelrod, President Obama claimed he would have beaten Donald Trump if he had been allowed to run for a third term. “I am confident in my vision because I’m confident that if I had run again and articulated it, I think I could’ve mobilized a majority of the American people to rally behind it,” he told his former campaign chief David Axelrod on a CNN podcast interview. True Americans, even forced at gunpoint, wouldn’t have voted for you again King Barack. Obama also blamed Rush Limbaugh, Fox News, and the NRA for distracting the country from his message of “hope and change”, particularly during the holiday season. “If we’re not actually out there changing the narrative like we are during campaigns, then folks in a lot of these communities, what they’re hearing is Obama wants to take away my guns,” he said. ” Obama is disrespecting my culture and is primarily concerned with coastal elites and minorities.” Ah yes, the problem was you couldn’t mindlessly brainwash the country Barack, not that your message was fundamentally anti-American. 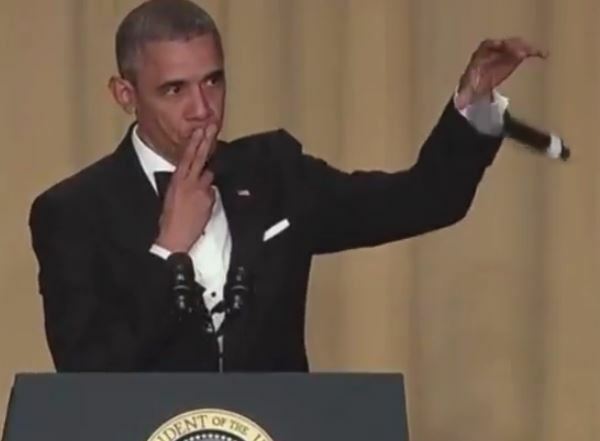 Obama continued by blaming Hillary’s loss on a “biased media” claiming that she performed “brilliantly” despite a media biased for conservatives and against liberals. It’s hard to even imagine him saying these words with a straight face. President Obama droned on by blaming Trump’s victory in “small-town USA” on a “double standard” because Hillary is a woman. “Well, Trump, as you know, he won 200 counties that you — that you won and many of them are in these more rural or small town communities…Look, you know, I think that Hillary Clinton performed wonderfully under really tough circumstances. I’ve said this publicly, I’ll repeat it. I think there was a double standard with her.” Sure Barack, sure. The heartland and backbone of this country rejected you and your agenda because Hillary is a woman, not because you’re a Marxist, Islamist who has sold out his country at every turn. He added to his national embarrassment by blaming conservative media outlets for distorting his message and shining a spotlight on truths that didn’t align to his message.